Nutritional Yeast is a tasty Super Food for daily nutrition that is rich in B vitamins. They are a good source of high quality, bioavailable protein, containing both essential and non-essential amino acids, that is suitable for everyone, including vegans and vegetarians. These nutritional flakes are made with a specially selected strain of Saccharomyces cerevisiae (specially grown on molasses) that undergoes a fermentation process under carefully controlled conditions. It does not encourage candida or other yeast growth. Enjoy adding 1 or 2 tablespoons to a salad, soup or smoothie to give it a hearty, nutty taste. Children (and even pets) love the taste. 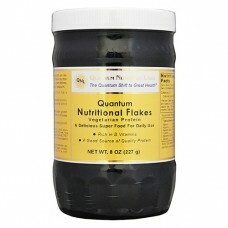 These are the Quantum Nutritional flakes. We also have the PRL Protein Flakes available. PRL Protein flakes are completely free of additives and have a mild taste. The Nature Foods ethos is "as natural as possible" so this is our first choice. Quantum Nutritional Flakes have added B vitamins to bring them to a specified B vitamin level. They have a stronger taste, which some of our customers like better. Whichever you choose, they are excellent quality. In the Superfoods chapter of Nourishing Traditions, Sally Fallon says: "Dried nutritional yeast is an excellent natural source of B complex vitamins (except for B12) plus a variety of minerals. Look for yeast that has been processed at low temperatures. Yeast does not contribute to candida as has been claimed— candida feeds on refined carbohydrates, not yeast. The late eminent physician Dr. Henry Bieler treated many cases of chronic fatigue with yeast supplements." Sprinkle 1 or 2 teaspoons over any food to impart a rich, hearty, nutty-like flavor. Alanine (280mg), Arginine (200mg), Aspartic Acid (456mg), Beta 1, 3 Glucans, Biotin, Calcium, Choline, Chromium, Copper, Cystine (40mg), Ergosterol (Pro-Vitamin D), Glutamic Acid (735mg), Glutathione (GSH), Glycine (200mg), Histidine (96mg), Inositol, Isoleucine (200mg), Leucine (304mg), Lithium, Lysine (360mg), Magnesium, Manganese, Methionine (72mg), Molybdenum, Pantothenic Acid, Phenylalanine (176mg), Phosphorus, Potassium, Proline (168mg), Serine (224mg), Tin, Threonine (224mg), Tryptophan (40mg), Tyrosine (152mg), Valine (240mg). Guaranteed Free of: Fillers, additives, magnesium stearate (a toxic excipient), corn, milk, soy, salt, sugar, wheat, artificial colors, flavors or preservatives. Nutritional Yeast is a tasty Super Food for daily nutrition that is rich in B vitamins. They are..